By David Goldberg, Goldberg Arts on Dec. 6, 2017 at 7:30 a.m.
Modelmaker David Goldberg recreates the iconic ILM miniature. The shot of an Escape Pod dropping away from the crippled Rebel Blockade Runner during the opening sequence of Star Wars: A New Hope has always been a favorite of mine. The imagery is perfection in its simplicity. Reminiscent of a NASA film of booster separation on the Saturn V rocket, this iconic moment conveys an important story point with images that are both new and familiar. This shot was also a historic one as it was the first visual effect completed by the fledgling Industrial Light and Magic team. The story is that executives from 20th Century Fox were growing increasingly concerned over the amount of time and money being spent on the unproven visual effects department which had so far failed to deliver any footage. Fox threatened to shut them down if they couldn't show some progress. 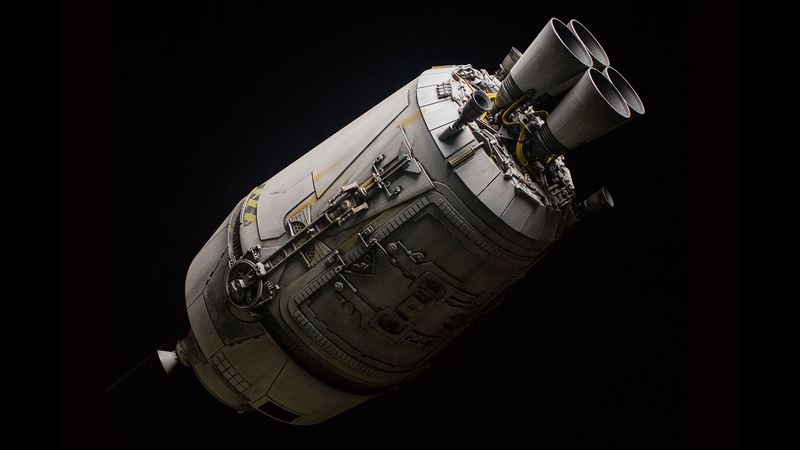 Led by visual effects supervisor John Dykstra, model shop supervisor Grant McCune and visual effects cameraman Richard Edlund, the ILM crew hurriedly assembled the model of the Escape Pod, suspended it from the ceiling of the stage over a plain black backing below and filmed it dropping away from the camera in slow motion. A few flakes of mica were tossed in to recreate the look of ice crystal sparkles seen in the NASA footage and a classic film moment was born. The shot was what is referred to as being done "in-camera", no motion control, no composites, just shoot it and done! The execs at Fox must have liked what they saw because the rest is history! 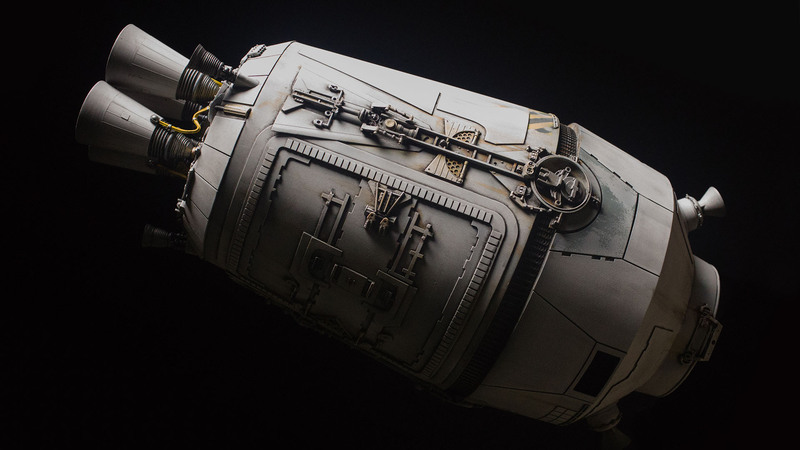 I've recreated a model of the Escape Pod in what is known as Studio Scale, the same size as the original filming model and using parts from the same vintage model kits for the detailing. 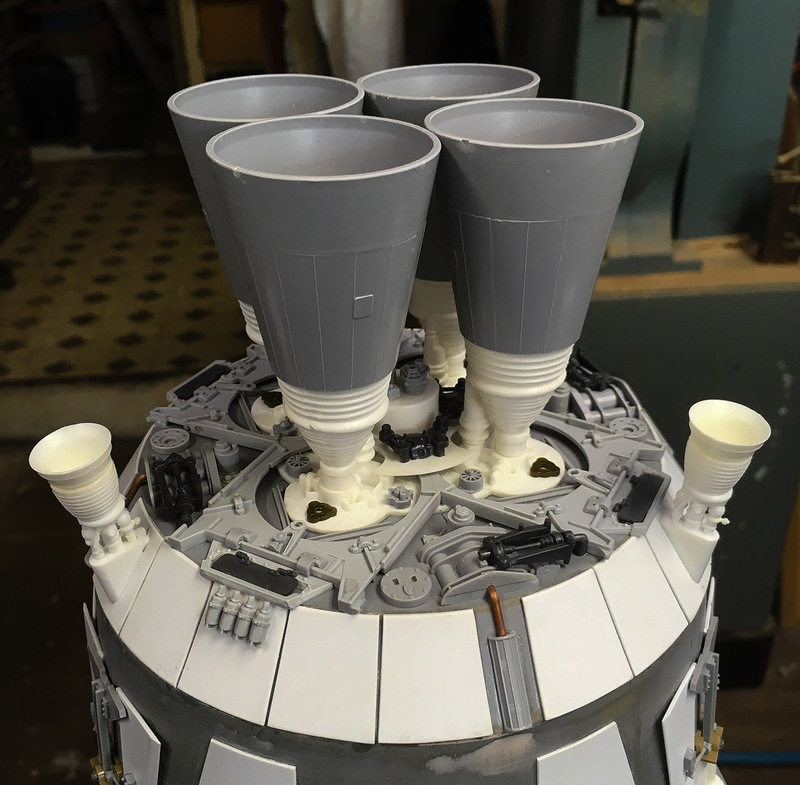 The original ILM modelmakers created the conical form for the filming model by taking some empty, greasy, paper Kentucky Fried Chicken buckets and filling them with expanding two-part urethane foam. Once the foam had hardened the paper buckets were peeled away and the resulting shapes wrapped with sheet styrene plastic. 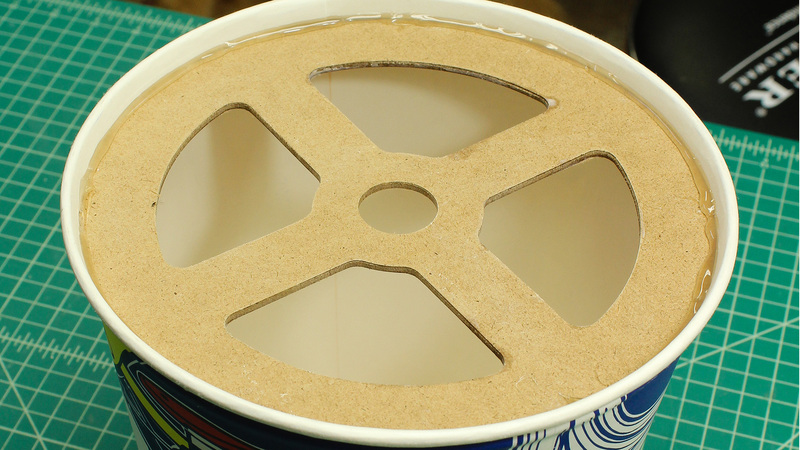 For my model I used 5-quart paper paint buckets, as vintage KFC buckets on EBay are a little pricey! 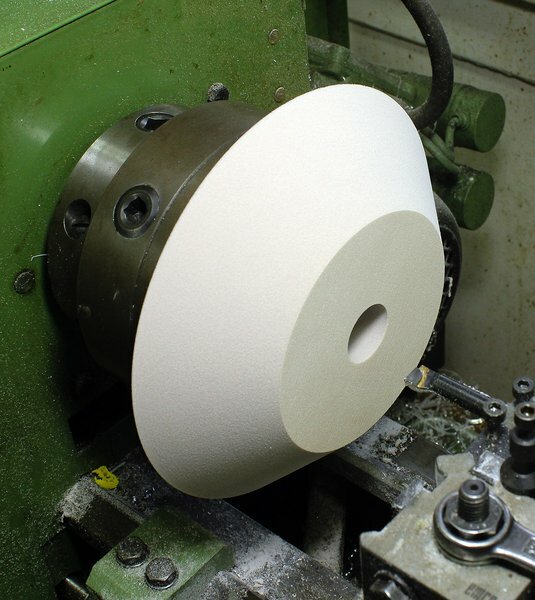 Round fiberboard discs were fit snuggly into to each end of the bucket to hold the round shape and a two part (non-foaming) casting resin swirled around the inside to build up a shell that was approximately 1/8" thick. 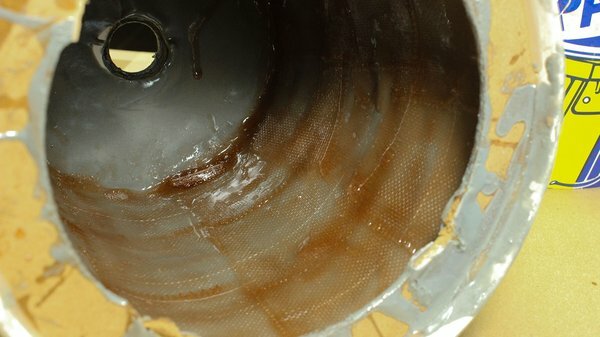 For additional strength and rigidity a single layer of fiberglass was added to the inside of the fully cured resin shell. I prefer to use epoxy resin for fiberglass work. It's pretty expensive but far less toxic and doesn't stink up the whole shop like polyester resin does. Following a 24-hour cure the paper buckets were peeled off and I had two nice hollow resin shells. A bit of trimming and they were ready to go. 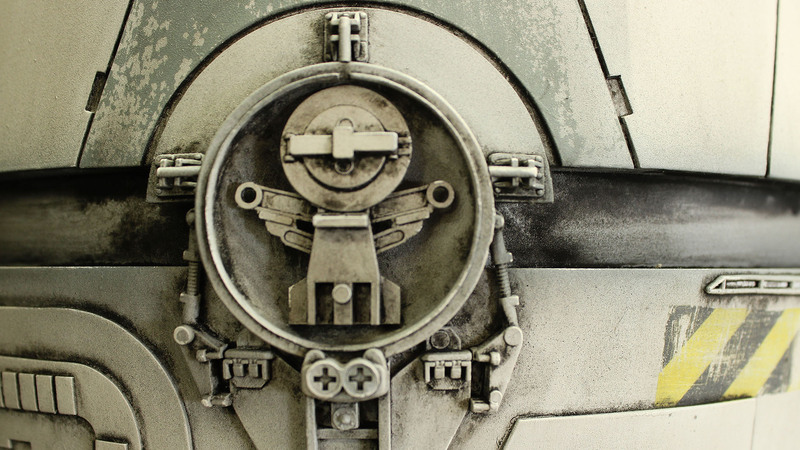 Measurements from the resin shells were used as the basis for 3d modeling the Escape Pod using Rhino 3D software. I typically design a model in the computer before building it in order to work out patterns and parts. 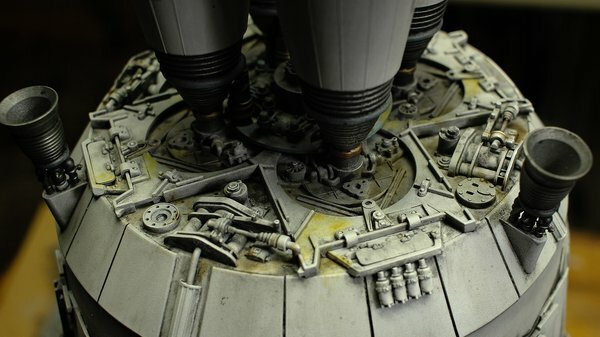 Sometimes a computer model can also used for 3D printing but in this case everything on this model was scratch built and kit-bashed, no printed parts. 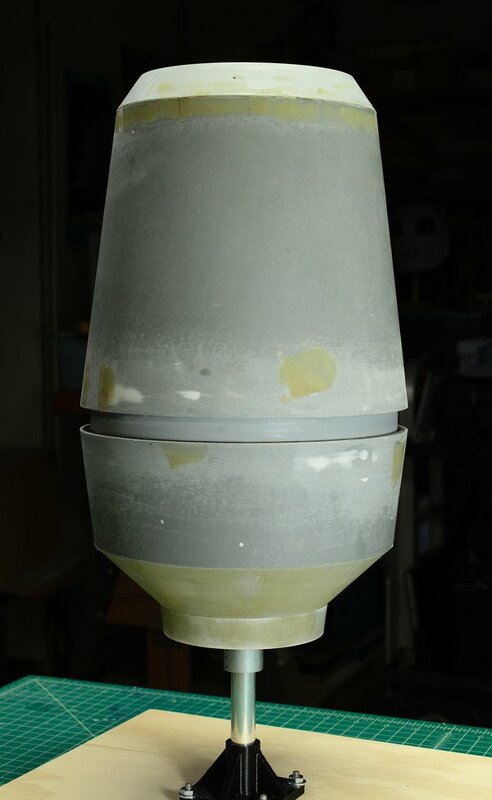 Based on dimensions worked out on the computer, the conical sections for each end of the pod were turned on a lathe from 30-pound density rigid urethane foam. 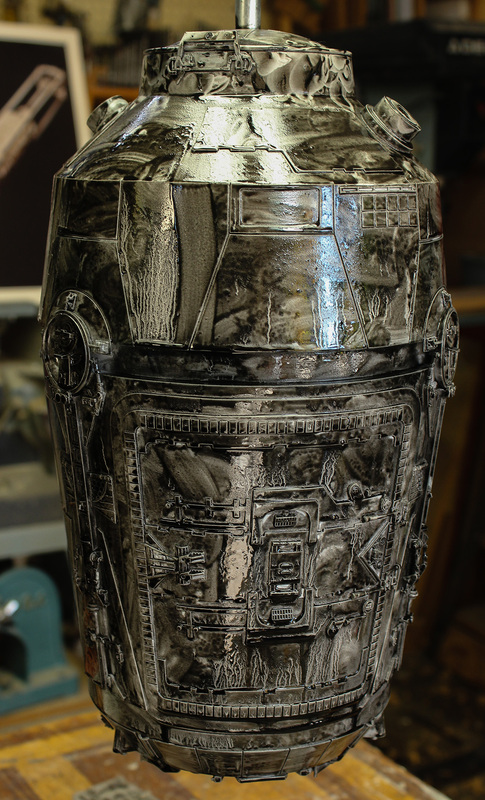 The shells and turned ends were all epoxied together around a simple armature and any gaps and rough surfaces filled with automotive putty and sanded smooth. With that had an Escape Pod hull ready for detailing! 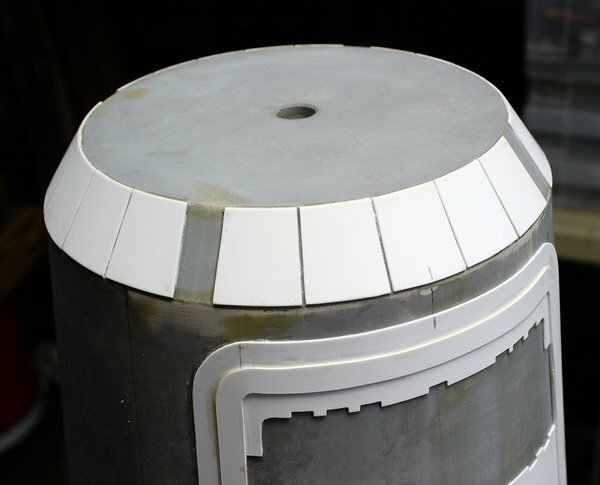 The first layer of detailing for the pod was a variety of panels cut from styrene sheet plastic. This included several layers of styrene used to make the door, which was also edged with several dozen little styrene chips cut from strip stock. The styrene plating was worked out first on the 3D computer model, then patterns exported that could be printed and used to cut the pieces by hand out of styrene sheet. I used a nibbler tool to cut the 1/4" notches on some of the plating edges, just as was done by the original model makers. The cut parts were taped in place and glued down with water-thin super glue run around the edges. 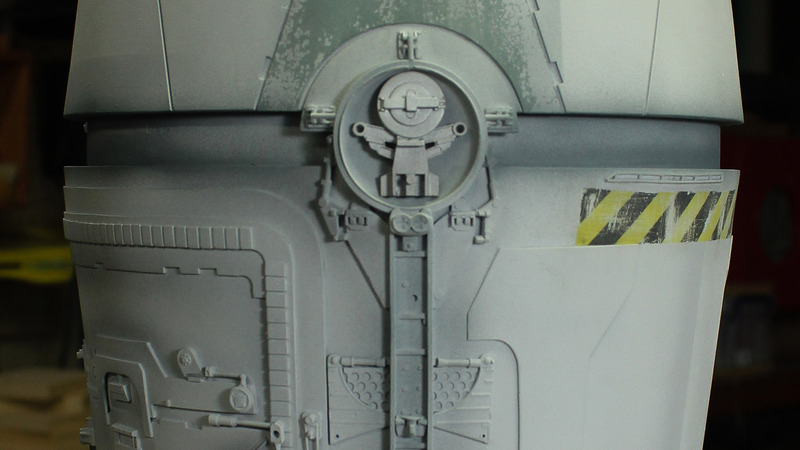 Strip styrene was also used to create additional details on the door and a few other places around the model. 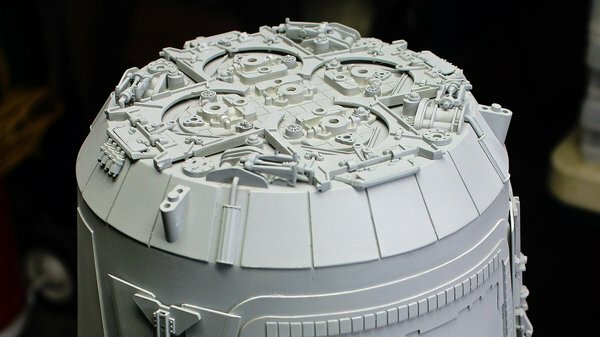 The iconic look of the original models for Star Wars was due in large part to the extensive use of detail parts scrounged from plastic model kits. There are photos from the time showing floor-to-ceiling stacks of model kits being used for these parts known colloquially as "nernies" or "greeblies". 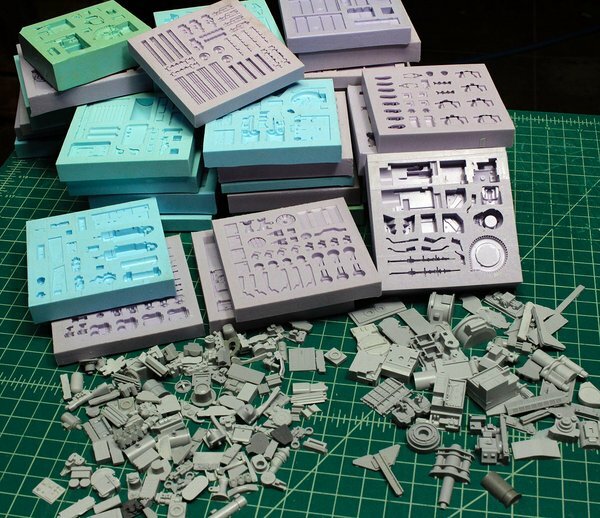 While some of these model kits are still available, many are very rare with some vintage kits selling for hundreds of dollars on eBay. 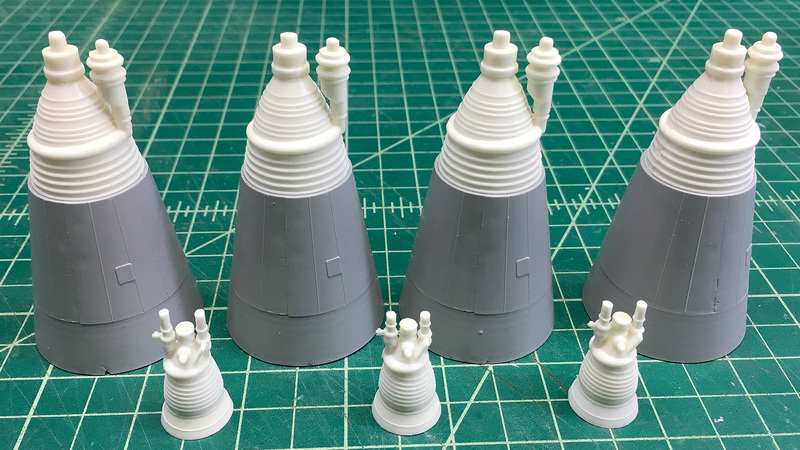 Fortunately I have a fairly extensive collection of nernie molds from my Y-Wing project and I was able to use resin castings of many of the original parts for most of the details. For the places where I didn't have a mold of the original kit part I just scratch built a reasonable substitute out of styrene or substituted with a similar detail part. It's okay with me that this model is a little different from the original. It makes it my own! I like the idea that the side mechanical details on Pod might be some sort of deployable control fins for use in the upper atmosphere. So I made sure to leave the tips of the triangular details floating a bit rather than conformed to the curve of the hull. On the original model these may have been wing parts from a Phantom jet kit, on mine they were scratch built from styrene sheet. 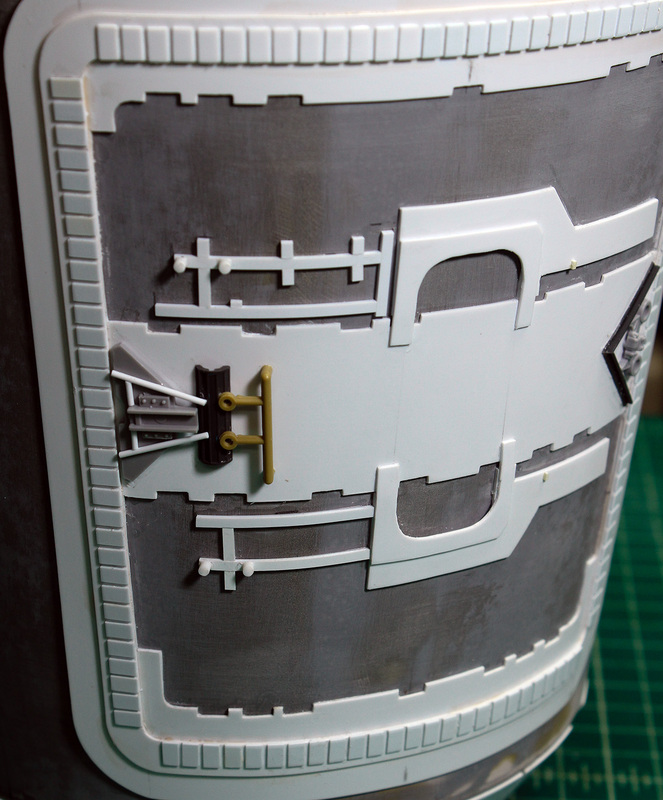 Detailing continued with fitting various kit part castings to the hull. 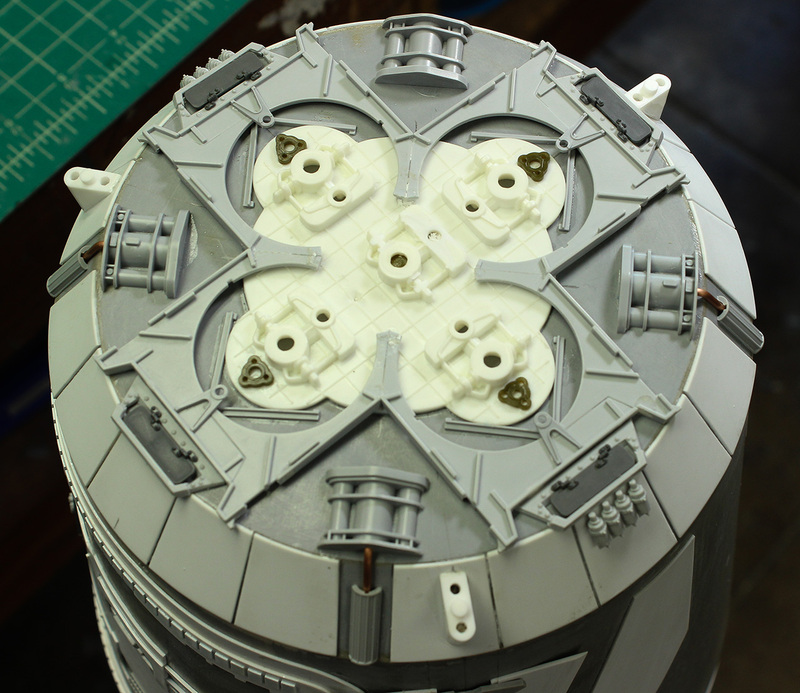 The four grey C-shaped parts on the back end are castings of a part from an Aurora Sealab model kit. One of the rarest of the vintage model kits, the Sealab can sell for over $600 on eBay if you can find one! For the model mount built into the inside of the model I used a tube with a 5/8" inner diameter. This allows the use of a 5/8" rod as the display stand. 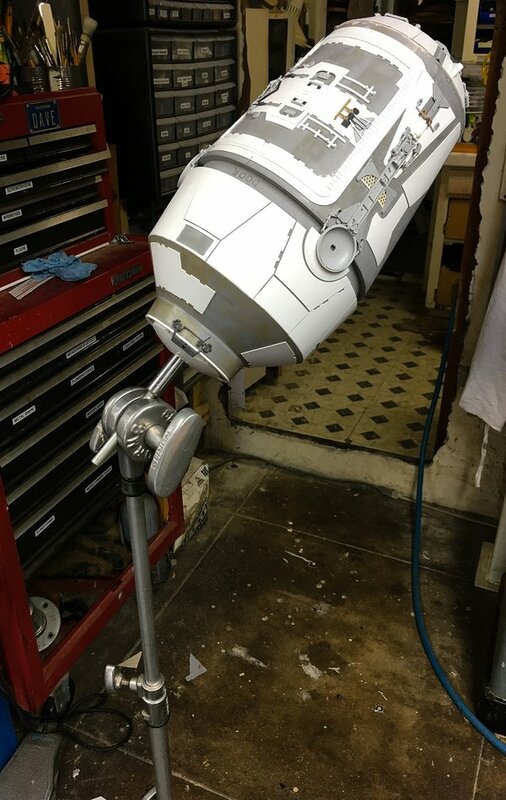 This was also a size we commonly used "back in the day" for model mounts as it allowed the use of standard stage grip equipment, which is based around a 5/8" diameter pin or pipe, to hold models for construction, painting and filming. I have a variety of grip equipment that proves helpful now as a model stand. The engine nozzles were made from parts taken from a vintage Saturn V model kit. It had plenty of nozzles, the white parts, but only one LEM shroud, which was used for the large end of the nozzles. 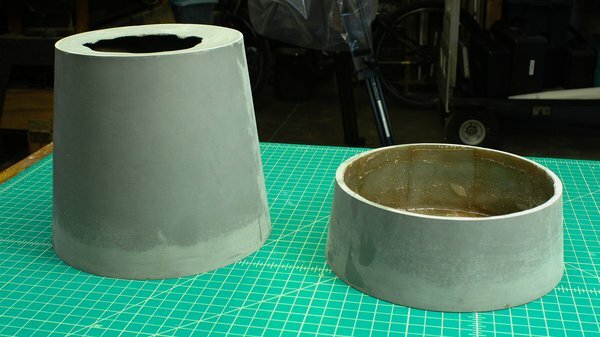 The solution was again, to mold and cast the four parts necessary to complete the structures. Once all the detailing was finished the model was sprayed with grey lacquer automotive primer. This is one of my favorite parts of the entire modelmaking process. The grey paint unifies all the variously colored bits into a cohesive whole. To paraphrase The Dude, "It really ties the model together!" Moving forward on the painting I mixed up a light grey using acrylic hobby paints as the base. It looks pretty light to the eye but subsequent weathering should darken it down considerably. Over the base coat I airbrushed some panel line and other shading with some darker grey acrylics. The trapezoidal grey panels and yellow and black caution stripes were painted over chipping medium so I could come back and chip away some of the paint back to the base color. 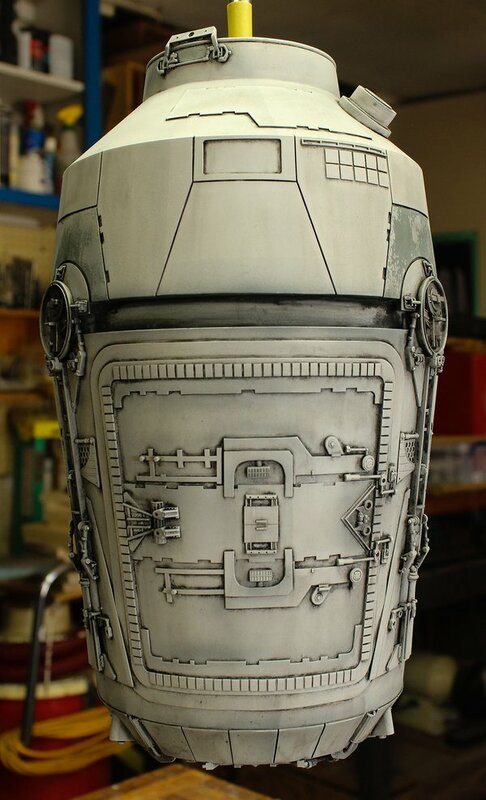 Chipped paint is a hallmark of the Star Wars style. The models in Star Wars were grimy and well worn, a far cry from the pristine spaceships seen in science fiction movies ip to that time. It was one of the things that made the visual style of Star Wars so unique and identifiable. For the grimy weathering I use artist's oil paints (the kind that come in tubes) to create a wash. This accentuates the panel lines, crevices and other details. The long drying time of artist's oil paints allows for the effect of the wash to be reduced by rubbing the surface with a solvent soaked rag. Before applying the wash the entire surface is brushed with clean paint thinner. Then a wash made of ivory black oil paint cut with turpentine is liberally brushed over the model. Then I wipe off as much of the wash as possible with a clean rag. Further wash is removed with rags moistened with paint thinner. Generally I worked the rags in a linear fashion from top to bottom, which makes for nice vertical streaking. For areas that were difficult to reach with the rag, cotton swabs or a paintbrush moistened with a little thinner was used. Again, the nice thing about artist's oil paints is that even after the solvent has evaporated they still take a few days to truly dry. This means I can continue to go back and remove or blend out the wash with a little paint thinner. Once the overall wash had dried for a few days I went in and did some spot weathering, again using artist's oil paint. The color palette for the detail weathering was a rusty red, an oily black and yellow ochre. After that had dried I did some dry brushing with metallic colors on some of the edges to add highlights. The engine nozzles were also weathered down with some burnt metal metallic colors sprayed with an airbrush. 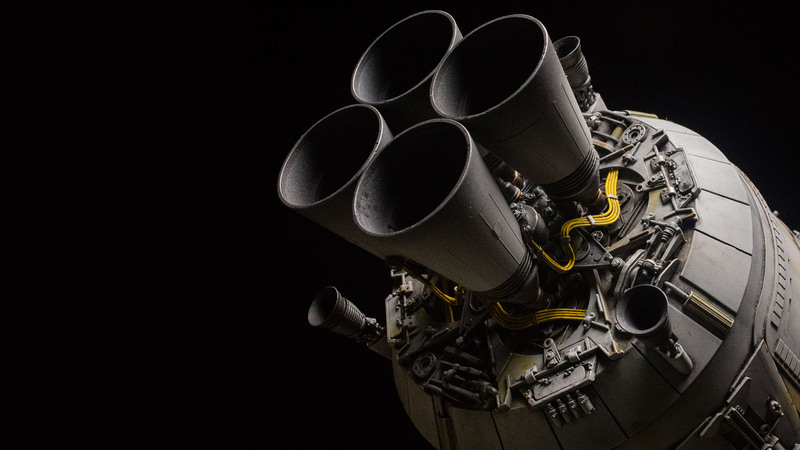 The final detail needed was four cable harnesses, one attached to each of the main engine nozzles. These were made from copper wire bent to the desired shape and soldered together. 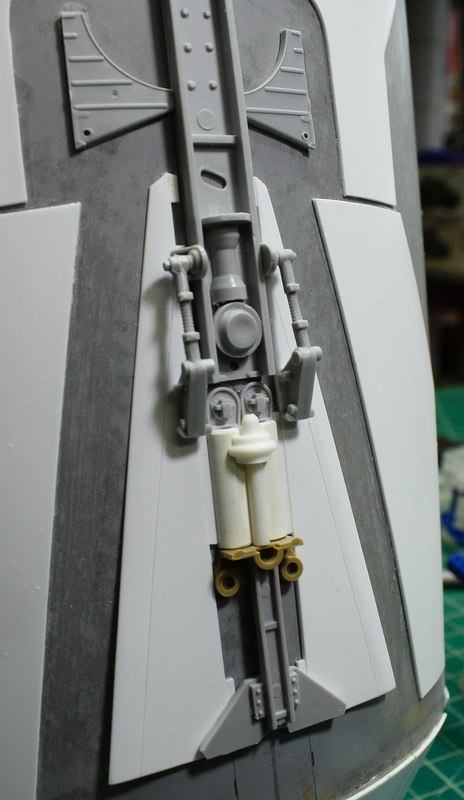 The finished cables were painted bright yellow, then weathered down before being glued in place on the model. 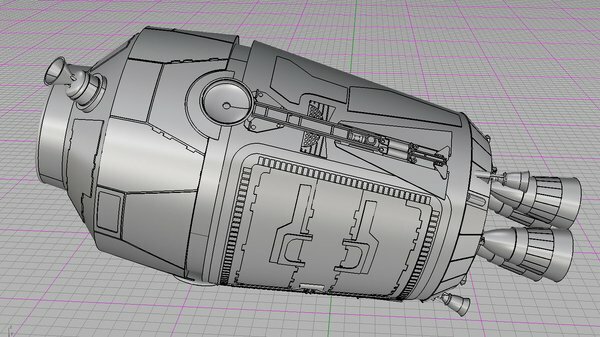 And with that my Escape Pod model is complete! This project was one of the most enjoyable and fun model builds I've done in a long time. It's a wonderful piece that everyone recognizes and I'm thrilled to show it off! David Goldberg is a professional modelmaker, propmaker, visual effects supervisor and mechanical designer with more than 30 years experience working in the motion picture, television and theme park industries.